I first met monarch butterflies in 1970 while working as a farm hand on my brother-in-law’s truck farm on Nantucket Island. I was trying to understand how milkweed flowers changed to produce milkweed pods and I brought home the caterpillars by mistake. Very soon all of my attention was focused on the yellow, black and white caterpillars munching on the milkweed. I was fascinated by their metamorphosis into a jade-green chrysalis and emergence as beautiful orange and black butterflies. They became my teachers, a metaphor for my life and eventually a central focus for much of my work. 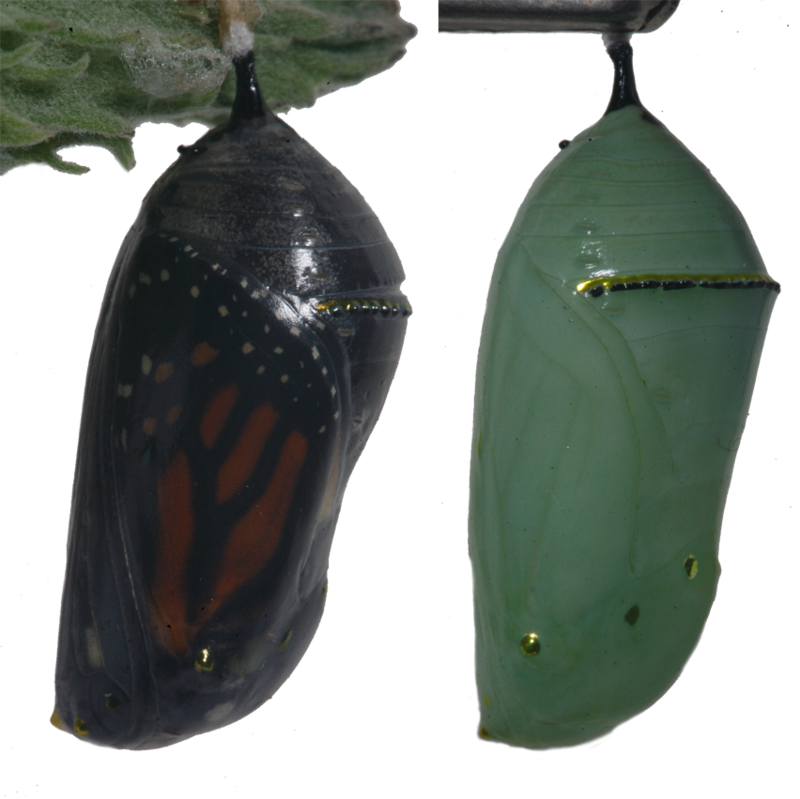 We tend to think that a monarch goes through major metamorphosis when it becomes a chrysalis or when the butterfly emerges from the chrysalis, but in fact the parts that will transform the caterpillar into a butterfly are present from the time that the egg hatches. 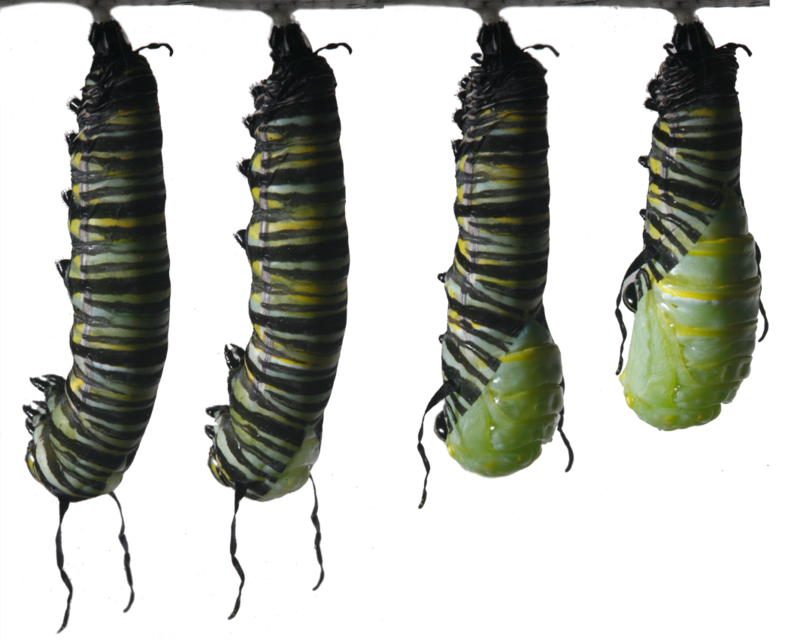 Inside the caterpillar are “imaginal disks.” As wonderfully fanciful as the word imaginal sounds, it is actually referring to the adult stage of the monarch which is called the imago. These disks are the cells that will become the butterfly’s wings, legs, proboscis and antennae, among other things. By the time the caterpillar is half an inch long its butterfly wings are already developing inside it. By the time it is a full grown caterpillar all of the imaginal disks have grown considerably. 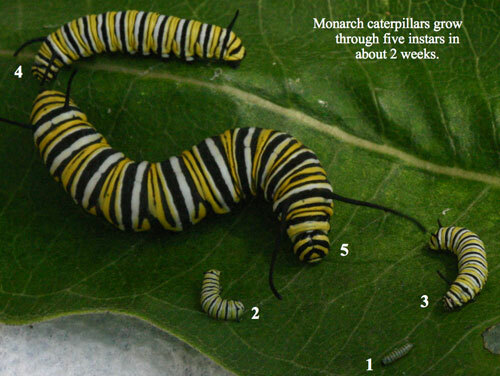 Monarch caterpillars are the larval stage of monarch butterflies. The larval stage is the growing stage. 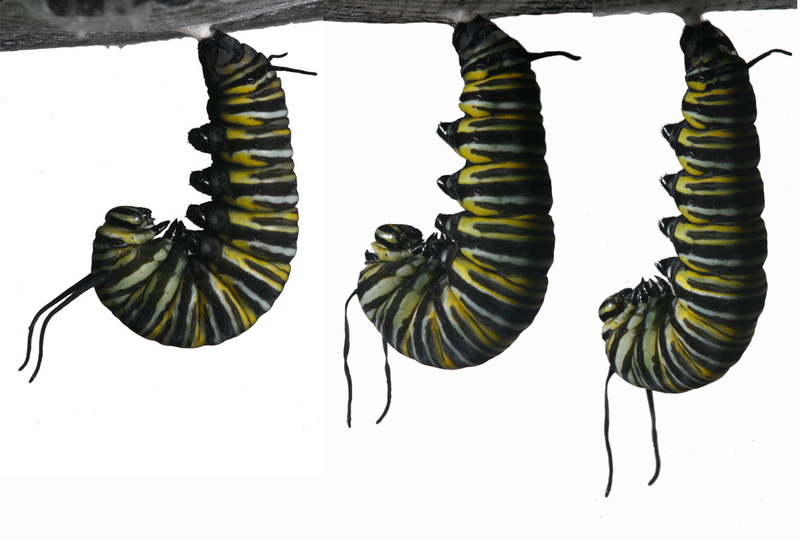 A monarch caterpillar will increase in size 3000 times in the two weeks from the day it hatches until it is ready to pupate and become a chrysalis. Monarchs are insects and like all insects they have to shed their exoskeleton and grow a new larger one several times as they get bigger. A monarch caterpillar sheds its exoskeleton 5 times. It goes through five instars. An instar is a stage between molts. When the caterpillar emerges from it egg it is a first instar caterpillar. When it sheds its exoskeleton the first time, it becomes a second instar caterpillar. After about 18 hours of hanging in “j” ( the time may be longer if it is cool or shorter if it is hot), the exoskeleton begins to split between the front filaments. As the monarch wriggles and pushes its exoskeleton toward the last prolegs where it is holding on to the silk button, it must execute a very tricky feat. With the wad of discarded exoskeleton and the last two prolegs that are holding the monarch up, only tenuously attached to the emerging chrysalis and lodged on a couple small protrusions on the chrysalis called holdfast tubercles, the monarch must pull a small stick like appendage, called a cremaster, out of that wad of old skin and drive it into the silk button. Its exoskeleton is very soft and pliable at this point. The monarch cannot afford to fall. Its exoskeleton is not sturdy enough to withstand an impact with a hard surface. The chrysalis with all the beautiful new butterfly parts it has been growing would splatter. Accidents like that have made some people believe that at this point the monarch is nothing but a loose soup contained inside the chrysalis exoskeleton, but in fact it has a beating heart, a respiratory system, emerging wings, antennae, legs and proboscis–all kinds of organization and function. It just needs a little down time to complete and switch over to the new system. Old, no longer needed caterpillar parts must be reabsorbed and the butterfly parts formed by the imaginal disks must be completed. It MUST attach itself directly to that silk button. 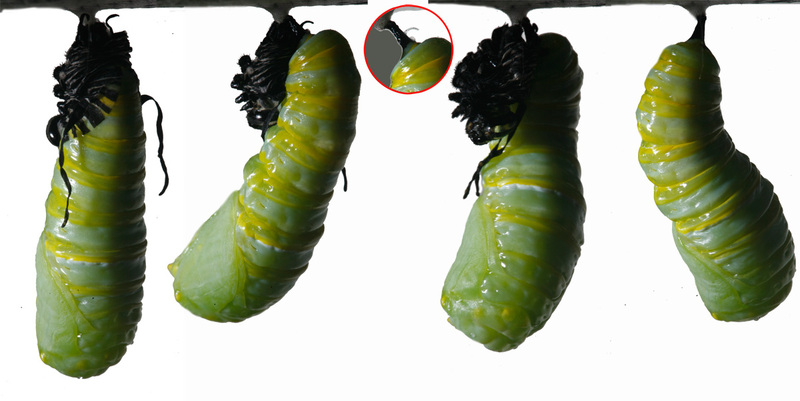 It will take a few hours for the chrysalis to pull itself into a neat, compact form and for its exoskeleton to harden. You can see the proboscis, antennae, wings and legs on the surface of the chrysalis, and locate the spiracles through which it can breathe. ( An excellent picture of a newly formed monarch chrysalis, which very clearly shows the antennae, legs, wings, proboscis and other body parts of the developing monarch, can be found on Edith Smith’s (of Shady Oak Farm) Wednesday, January 21, 2009, Blog page “What is Going On Inside a Monarch Chrysalis?” Please check out the link on the sidebar. ) If you examine the segment just below the six dots under the cremaster you can tell whether the monarch is a boy or a girl. Girls have a little crease or indentation in the segment. The monarch will be a chrysalis for about 10 days (longer if it is cooler, shorter if it is hotter). An excellent picture of a newly formed monarch chrysalis, which very clearly shows the antennae, legs, wings, proboscis and other body parts of the developing monarch, can be found on Edith Smith’s (of Shady Oak Farm) Wednesday, January 21, 2009, Blog page “What is Going On Inside a Monarch Chrysalis?” Please check out the link on the sidebar. 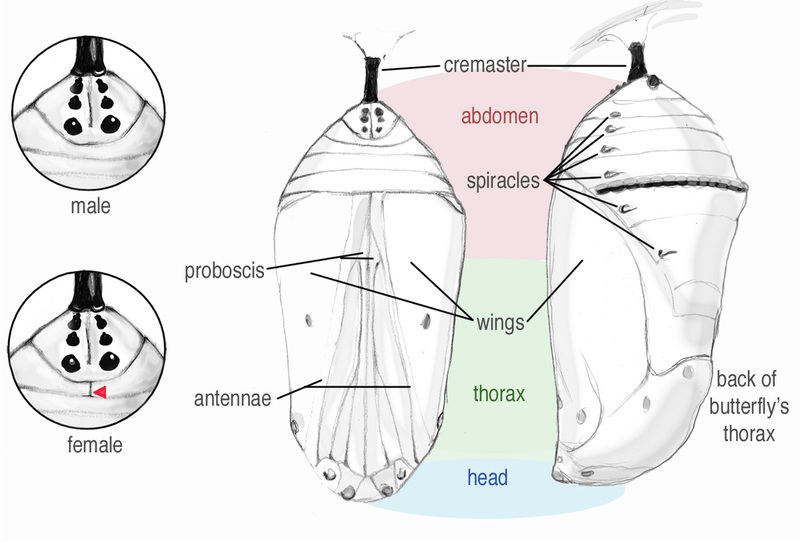 The triangular piece of chrysalis exoskeleton covering the antennae, legs and proboscis breaks open first. The monarch swings down and out of the chrysalis with a huge abdomen full on hemolymph ( the insect equivalent of blood), tiny wings and a proboscis in two pieces. As contractions move up and down the abdomen, forcing hemolymph into the veins of the wings and expanding them, the monarch knits together the two sides of its new mouth. Once assembled, the proboscis will be perfect for drinking nectar. When the wings are fully expanded the butterfly will excrete a few drops of reddish liquid. This is meconium, it is the waste produced by the monarch while it was a chrysalis. It probably held onto it until after the wings were inflated to give itself an extra little bit of pressure to help force the hemolymph into the wings…or maybe it was just too busy to deal with it until it was done with all that other work! All summer long monarchs will eclose from their chrysalides, mate and lay eggs. A female may lay anywhere from 400 to 1200 eggs over her 4 week life time. But at the end of the summer, a generation of monarchs comes out of chrysalis ready to live 8 months and take on a great migration to the monarch reserves in Mexico or, if they live in California and in the west, to roosts along the coast. These butterflies will emerge in reproductive diapause (they will be sexually immature) and they will be ready to follow cues to a place where the temperatures and moisture are just right to allow them to wait out the winter months before they return to their summer breeding grounds in the spring. As usual, thank you and Mark for this great illustration and explanation. The best! I am so fascinated. I just found my very own pupae yesterday and today after planting milkweed in the spring. All of this information has been so helpful and intriguing. One question remains: what makes the little gold bits on the skin of the chrysalis gold? ots and whole surfaces. It may just be they way they are like red or black hair or brown or blue eyes. I am glad I found your site. The information is wonderful. I have 2 chrylisas to eclose yet. It is pretty chilly here, 60’s and colder at night. I brought the aquarium into the house from sunroom because of the low night temperatures. Two butterflies eclosed on 9/21 & 9/22. I am hoping the weather will get alittle warmer so I can let them go soon. I have tagged 30 Monarchs so far. I will be checking my e-mail for more from you. Wonderful blog – from South Africa! Thanks so much for the detail – love the photos. I am taking part in a moth research in South Africa at the moment and have a chrylisas which is close to eclosing – I hope it will be a moth, but who knows? Can one tell, Ba Rea? Hello everyone, after hearing about the monarch population going extinct in Hawaii, we don’t have the migrating monarchs to aid in population, I decided to get a few milkweed and help them along since the gmo’ and pesticides are killing off these guys. At first planted outside I had many caterpillars but they all became lunch for various predators such as ants, geckos, myna birds, wasps…so I brought the plant inside if I saw a caterpillar at intar 3 stage and finally it survived long enough to make a chrysalis! I then setup my camera to do a time lapse videography of the chrysalis event, which since Its my own video I don’t see a problem in posting it, hope I didn’t break any rules. Here is the video I made ( http://youtu.be/2EoYQs0JLYQ ). It was truly such an amazing thing to witness for the first time in my life. Pictures don’t do it justice because I have this beautiful jade chrysalis now hanging and it is miraculously gorgeous! I feel everyone should give this a try! I hope everyone enjoys the video! Mahalo! I found my first monarch caterpillar of the season outside on my milkweed plant. My milkweed plant isn’t doing so well so I put him in a critter cage with some fresh milkweed leaves from neighbors plant which has more leaves on it. He’s been eating and is still very small and it seems he’s already going in the horizontal position before they “J”. This seems way too soon. Might there be something wrong with him? Cathy it is impossible to know without seeing the caterpillar, and even then it may not be immediately obvious. There may be something wrong but, if the temperatures are low, growth will be slow. I suggest that you keep an eye on the caterpillar and see what happens. This is a terrific resource! The information is clearly stated and the photos show the progressions perfectly. Thank you! You are helping generations of Monarch by providing this information so people know what to look for and what to do. My monarch larva started to go into chrysalis and stopped and is just hanging straight . Day 2 still the same as day one . Should I move it out of the cage ? I have others that did not do that . Yes. 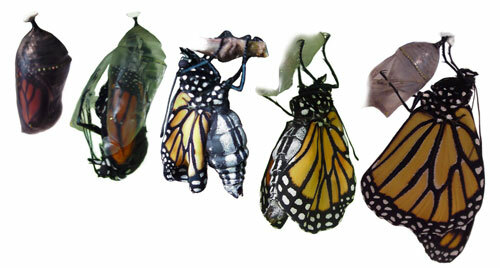 If the metamorphosis to chrysalis stops like that the monarch is dead. Also it is important to make sure that you remove any parasites that might have been responsible for the death. Look for maggots or small dark brown pupa that may have fallen to the bottom of your container. It would be best to completely empty and clean the container. so that any other caterpillars/chrysalides are not infected. My grandson and I rescued 10 Monarch caterpillars from a milkweed patch I had established next to my butterfly garden. We built a small butterfly house in our sunroom and placed the 10 cats in it. They began their metimorpis. One only began to establish a chrysalis the died. One completed the chrysalis but did not eject the exoskeleton. The rest seem to be morphing satisfactorily. My question is will the one that did not eject the exoskeleton survive and your opinion why this occurred? I had to bring my larvae inside because of the cold. What can I provide for them to form their crystallis on? They will lay down a mat of silk threads and form a silk button in the middle of it to hang from to change into chrysalides. They will likely go to the top of any container but if there is vegetation (live or dry) they may choose that as well. Make sure the top of your container is not collecting moisture…sometimes the silk doesn’t adhere well on a damp surface…Best of luck! .monarch emerged with hind legs fused together is there a way I can help it thank you? Sorry for the slow response. People often think their butterfly is missing a set of legs because the front two legs are tiny and tucked into the scales so very hard to see, but I have not seen fused hind legs. Wow! Thanks for sharing this wealth of information. It’s just amazing. Very well written! Excellent! I live in the sububrbs of Buenos aires. Some months ago a girl gave me a plant of asplenia where I’m watching a larvae becoming pupa today. There were other three worms just the same siza, but they just disappeared out of my sight . I guess they hung from am adjacent plant, but it’s impossible to find them. Thank you for sharing such awesome photos and your experience. I am in Adelaide, South Australia and have found your blog so informative. I especially appreciated the photos and diagrams, showing ages and stages. We were given 3 swan plants a year ago and our first butterflies flew off today! Great Information! I currently have 11 cats on 3 different milkweed plants. Had 13, but 2 have already gone off to form their chrysalis and can’t find them, yet. I have my milkweed surrounded by other plants to give the cats options on where they can form their chrysalis. The plant they seem to like best, is my Peace Lily. On top of all that I check my milkweed plants daily i’ve been dealing with aphids and in the process of getting rid of them I have found more Monarch eggs, YAY! I live in central Florida on the west coast and the weather has been great. Perfect for all my cats to become beautiful Monarchs!! A very informative site thank you. I am in Wellington , New Zealand and have for years have grown swan plants. I must do some research on the 4th generation. I just assumed the late summer, early autumn monarch’s did not mature because of cold weather. In the warmer parts of NZ the monarch’s winter over, flying around when its sunny and sometimes huddle together on trees when its cold. I posted earlier this month about my cats and MONARCHS and I am back to share my SUCCESS thus far. Two Monarchs eclosed on Friday, another one yesterday and four this morning! On top of that I have discovered several more chrysalis’, as well as numerous cats in the 2nd and 3rd instar stages. I hope my luck stays good and they all grow to be beautiful Monarchs. Still fighting with aphids, but not as many since i’very been keeping tabs on them. That’s it for now. Have a fantastic day everyone! I’m putting together a display for our Nature Center for May-July. Would you grant permission to use your 5-instar photo as part of the display? Thank you! Fantastic! Could you send me the file so I can get it printed as an 8×10 picture for mounting? Were you able to use the larger file I sent you? This is the MOST informative website I have ever come across. I have been growing milkweed and bringing caterpillars into the house in mesh cages and never knew so many things about them. I particularly loved learning so much about what is in the chrysalis and what is happening during that time. Thank you for sharing your knowledge ,great pictures and great diagrams. Also I have a cat that just made its chrysalis but it’s bright yellow not green. Is this normal? Also some of it’s skin is still at the top of the chrysalis by the cremaster and didn’t pop off. Should I just leave the skin or try to remove it? I would recommend moving your still caterpillar (complete with whatever surface it is resting on, to a separate container in case it has some disease, but otherwise just watch it. We all develop and grow at different rates. Caterpillars typically lay down a mat of silk threads, attach their prolegs and stay still before molting. So much happens when they molt. The exoskeleton they shed is so much more than just an outer layer, it lines the breathing tubes beyond their spiracles and more. With regard to the yellow chrysalis, I have heard of that but never seen it. It is best if the caterpillar knocks its old exoskeleton free before the chrysalis hardens as that makes it less likely that it will get pinched into the hardened chrysalis exoskeleton and introduce infection, but you run the risk of doing damage trying to remove it if it has become stuck on the chrysalis. I would recommend a watch and don’t worry approach for that as well. It won’t make it any harder for the butterfly to eclose…and may just fall away on its own in time. Let me know how it all turns out! Enjoy. I love how much I learn when I am watching monarchs grow and become butterflies. Added update. The yellow deflated chrysalis now has a long silk string hanging down from it. It must be dead right? No idea what happened except that when it changed into a chrysalis is seemed to take longer than usual and never was able to pop off the exoskeleton at the top. Other than that it was a very healthy and hungry caterpillar. Maybe since it had J’d on a leaf from the plant instead of a sturdy surface it didn’t have enough support to form a good chrysalis?